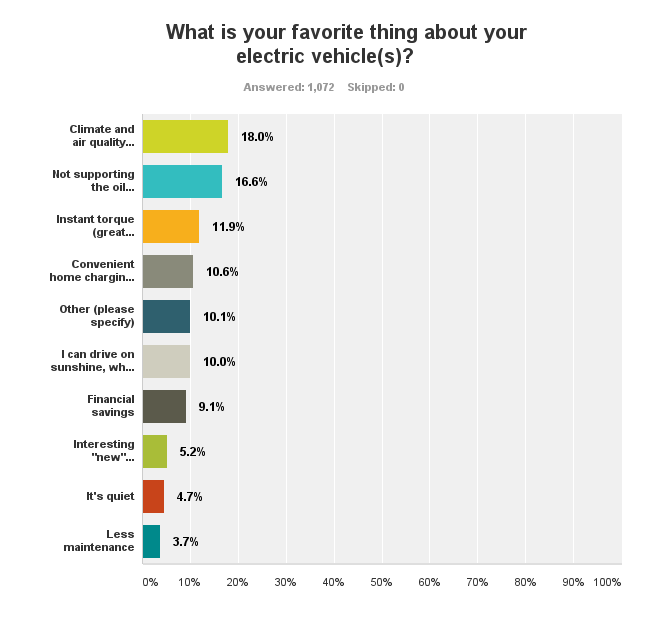 In our 5th article pulled from Electric Cars: What Early Adopters & First Followers Want — a new report from CleanTechnica, EV Obsession, and GAS2 — I’m jumping into some of the best things about electric cars. 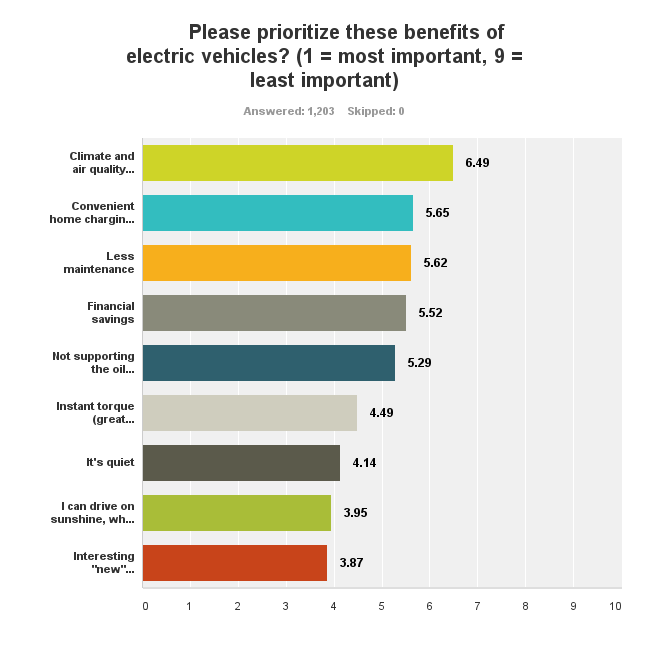 Let’s skip and jump through some of the key reasons respondents are interested in EVs, as well as some of the ways greater interest in EVs could be inspired in the masses. This matches well the assumed profile of initial EV adopters. Many early adopters, aka “pioneers,” are attracted to EVs because they help to combat global warming, reduce pollution, and reduce our dependence on oil. However, right behind those are the two things that I see as being most critical to mass adoption of EVs. Most of the population is simply not going to buy greener cars like electric cars unless they offer a much better owner experience or save them a lot of money. As I’ve written many times before, the two huge consumer benefits that I think will drive EV adoption among the early majority and later one, and that make this a disruptive technology, are instant torque (which means excellent acceleration from a complete stop) and the tremendous convenience of home charging. Not too far behind these are the large fuel and maintenance financial savings that typically come with EVs. Regarding instant torque, this is what gives a low-cost, simple Chevy Spark EV more acceleration off the line than a Ferrari 458 Italia. This is what gives a former Camaro enthusiast and owner a more enjoyable driving experience in a Smart Electric Drive. Instant torque is a ton of fun, which one typically realizes right when they test drive their first EV. However, for those who don’t enjoy darting off the line, there’s still great benefit. Such acceleration makes it easier to turn or merge onto a highway, get into a roundabout, and sometimes get out of harm’s way. Anyone from a 17-year-old thrill seeker to a cautious grandma can appreciate this benefit. Regarding the convenience of home charging, this is a point that seems to be lost on the mass media, but it certainly isn’t lost on anyone who has lived with an EV. Instead of having to spend many minutes, hours, days, or weeks (depending on the timeframe you are considering) finding a gas station, getting off the road, pulling up to the pump, getting out of the car, pumping the gas (in a smelly and unhealthy environment), paying for the gas, getting back in the car, and getting back on the road, an EV driver can typically spend just ~3 seconds plugging in their car when they get home and then another ~3 seconds unplugging it when they leave. You don’t have to wait around while your car charges — you just go inside and enjoy time with your family, eat dinner, relax on the couch, etc. You typically leave your house with a “full tank” (in actuality, a full battery, of course) when you leave in the morning, unless you determine that you don’t really need a full charge every day and charge less frequently or just charge to 80% or so. This convenience is greatest when one has home charging, but even for many who don’t, workplace charging and destination charging can offer a similar convenience. While most of the population still isn’t aware of these electric car benefits, owners are very well aware of them. It’s interesting to see how the two populations differed in their responses here. That covers what EV drives and people planning to buy or lease an EV see as the big benefits, but how should we convey those benefits to the broader population? What are the most effective approaches. And what are the big incentives that would get more people to adopt EVs? That’s what follows in Electric Cars: What Early Adopters & First Followers Want, and I’ll share that in a coming article here on CleanTechnica.